DAY 80: Still feeling sick, I just slept in my hostel dorm bed all morning to recuperate. Joel the Australian chemistry student probably thought I was lame because instead of staying a couple more days to hang out like we were planning, he decided to ditch me and the city of La Paz and head south with a bus ticket. DAY 81: From what I’ve gathered, my initial reaction to La Paz is similar to many other travelers, that it’s just a big crowded city with no vibe or coolness factor. However, things started looking up when I left my hostel in the middle of dark alley to a new one in a livlier part of town, which had some amenities that the other one didn’t: hot water, toilets that flushed all the time and the absence of some guy who would sing loud opera tunes early in the morning. DAY 82: Before I left New York in October 2003, I didn’t have any visas — as an American, I can freely travel to most countries, in the tackiest clothes if I choose. Brazil is one of the few countries in South America that actually requires a visa for Americans, and with Rio de Janeiro’s famous Carnivale coming soon, it was about time I got one. DAY 83: Bolivia has been blamed for supplying the international drug trade with its coveted coca leaf — which is processed with ether and a bunch of chemicals to produce cocaine. However, the coca leaf in its natural form has been infused with Bolivian culture for centuries. Years ago, one of the first things a family would build right after a house to live in was a coca garden, as coca leaves were an integral part of Bolivian life. All this information was given to me at a visit to La Paz’s Coca Museum, where Lara, Tim and I went in the morning. DAY 84: One of the “Things to See and Do” mentioned in the Lonely Planet book was to visit San Pedro prison by ignoring all guards and police, nonchalantly walking into the prison and asking for someone to take you around for a fee. Lara, Tim and I had planned to do this, but after a night of partying hard amongst the Bolivians, we non-Bolivians needed a day to just rest. For most of the day, that’s just what we did. We learned that the prison visits were no longer available anyway. DAY 85: It has been called the “World’s Most Dangerous Road.” This route through the Yungas mountain range between La Paz and the little village of Yolosi starts at the peak of one of the mountains at 15,322 ft ASL and dramatically descends down to 4,460 ft ASL over the course of 63 km. The single lane dirt road hugs the mountains for vehicles to travel on — that is, if they’re careful enough not to fall off the edge and down deep into the valley. DAY 86: It had been over a week since I arrived in La Paz, and with my Brazilian visa slated to be ready, it was about time to move on. Tim looked on his visa pick-up slip and saw that his was to be ready on the 13th as well, despite that the guy said it wouldn’t be ready until the 14th. He tagged along with me on the way back to the Brazilian embassy in Sopacachi. DAY 87: In Stand By Me, the 1986 Rob Reiner movie about four boys who bond together during a two-day hike along train tracks in search of the corpse of a dead kid, the narrator (played by Richard Dreyfuss) says this: “Friends come in and out of your life like busboys in a restaurant.” This statement also rings true for people on the backpacker trail; you never know when someone you met before will suddenly be in your life again. DAY 88: Surrealist master Salvador Dali once visited the Bolivian deserts and salt flats, which inspired him in many of his paintings. 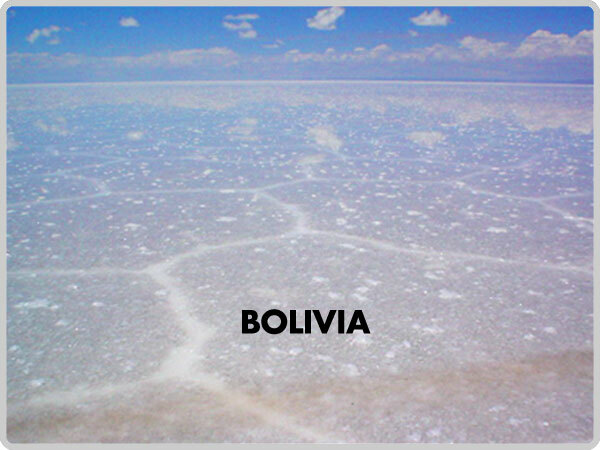 Before my trip to South America, I had seen pictures of the surreal landscape that he and thousands of other tourists had visited, and the salt flats became one of the reasons — if not the reason — for me to visit Bolivia in the first place. However, I didn’t know until my own visit that it wasn’t just the visual landscape that had a surreal element to it. DAY 89: After breakfast, we loaded up all the jeeps and went one by one into the surreal combination of the Bolivian desert landscape and 80s pop music. Each jeep was full of different characters which, over the course of the day, inevitably got secret nicknames from the characters of our jeep. DAY 90: Our wake-up knock on the door came about half an hour before dawn — at an hour the girls appropriately called “stupid o’clock.” The point of waking at such an hour was to catch the sunrise, and we were disappointed when we discovered it was too cloudy to see it — but we were already up and it was too late to slip back into bed. DAY 91: “Hey, check out the flavor of shampoo,” I instructed Sam in the bathroom of the hostel. I was referring to the packet of shampoo someone had previously left. Sam looked over and read it: “placenta.” We figured it was for that fresh “newborn” feeling in the morning. DAY 92: Potosi, the highest city in the world at 13,353 ft. ASL, was supposed to be a “five hour” ride according to the woman I bought my bus ticket from that morning in Uyuni. However I discovered by the end of the day that getting that high wasn’t as easy as she said. DAY 93: I woke up on a cold, southern hemisphere summer day in my Potosi hostel. Being in the highest city in the world at 13,353 ft. ASL, mornings are cold year round. With no real agenda for the day but to chill out, I just stayed under my three llama wool blankets in my room. DAY 94: Potosi isn’t just the world’s highest city; at one point in history it used to be the richest city in Latin America. Its wealth came from the abundance of silver discovered in the Cerro Rico, the big mountain overlooking the town. Mines were created in the 1500’s to extract the silver and other valuable metals, to process them and export them. Back in the day, many of the people in the mine worked as slaves that lived under poor conditions, including children — much like in Indiana Jones and the Temple of Doom, the 1984 Steven Spielberg classic where Indiana Jones (played by Harrison Ford) encounters a secret Thuggee cult financially supported by underground mines. DAY 95: In the late summer of 2003, Bolivians just about had it with their president. In protest of their leader, they went on strikes, set up road blocks in the countryside and protested, sometimes violently in the city streets — only to be dealt with the National Police. Since the changing of presidents in October 2003, peace came back to the country (allowing tourists like me to get in) and without the protests, the National Police put down their “brass” of arms and picked up another type of “brass” — tubas, trumpets and trombones — for the National Police Musical Band. DAY 96: At 13,353 ft. ASL, Potosi not only has its cold nights, it has its cold days too. As I typed away in an internet cafe after my complimentary breakfast, it was so cold I had to wear my woolen hat indoors — I wished I had some gloves. DAY 97: ”?Puedo tenir un Desayuno de Ch’aqui?” I ordered to the waitress in the Joyride cafe at a table with Sam and Zoe. The “Hangover breakfast” — an open-faced egg and ham sandwich — came after a few minutes and it really hit the spot at nine in the morning. It was a very “grown-up” start to what would otherwise be a very juvenile day. DAY 98: The thing to do on a Sunday morning in Sucre is to leave the city for the day and go to Tarabuco, a smaller town with its lively Sunday markets. Zoe, Sam and I hopped on a bus to these markets, a one-hour drive away. The “Moody Jacksons,” the family musical band we saw perform the day before at the Cafe Gourmet Mirador, was also on the bus ride. Again, the kids played unhappily while their father laughed like Tigger in Disney’s Winnie the Pooh at certain parts of the song. DAY 100: My night bus from Sucre drove along a bumpy dirt road through the night, under the desert moonlight that made the shapes of cacti look like ghosts in the desert. As the darkness of morning turned into dawn, the ambient light revealed a change of scenery — we had made it out of the desert and into the lush, tropical green landscape of the jungle. The bus made it to the Santa Cruz terminal one hour ahead of schedule on a sunny morning of what would be a scorcher of a day. DAY 101: After a quick breakfast of empanadas de pollo, Zolly and I split a taxi to the bus station for our day-trip to the nearby mountain town of Samaipata, a popular weekend getaway town for Santa Cruzians. It was possible to get there and its surrounding highlights on a bus tour, but we decided to wing it with public transportation. However, when we got to the bus terminal, we found that no public bus went to Samaipata. DAY 102: Lonely Planet’s South America On A Shoestring, which covers all the countries in South America in an abridged form, is a brick, weighing maybe two pounds. Lugging it around had become a burden for me — I already had the burden of lugging around cameras and electronics — and so early in my trip I took the suggestion of many travel gurus out there: rip out the sections that you need, as needed. At first I hated the notion of ripping out pages in my neatly bound book, but after the first rip, there was no stopping me — it was just easier. Ripping was a great idea as I could just fold 3-4 pages conveniently into my pocket, but it wasn’t such a good idea when I lost the pages I needed: the section about taking the train from Santa Cruz, Bolivia through the small tropical highland towns to the Brazilian border. DAY 103: It’s funny the things from your childhood that resurge in your mind out of nowhere when you’re alone on the backpacker trail. I woke up in my San Jose de Chiquitos hostel room singing the words to the theme of “Teeny Little Super Guy,” the stop-motion animated series of shorts that were shown on Sesame Street in the 70s and 80s. This random thought that was one of the more exciting things of a relatively boring day of waiting and walking in the Jesuit mission town.